The Collector-Bot reports to class. 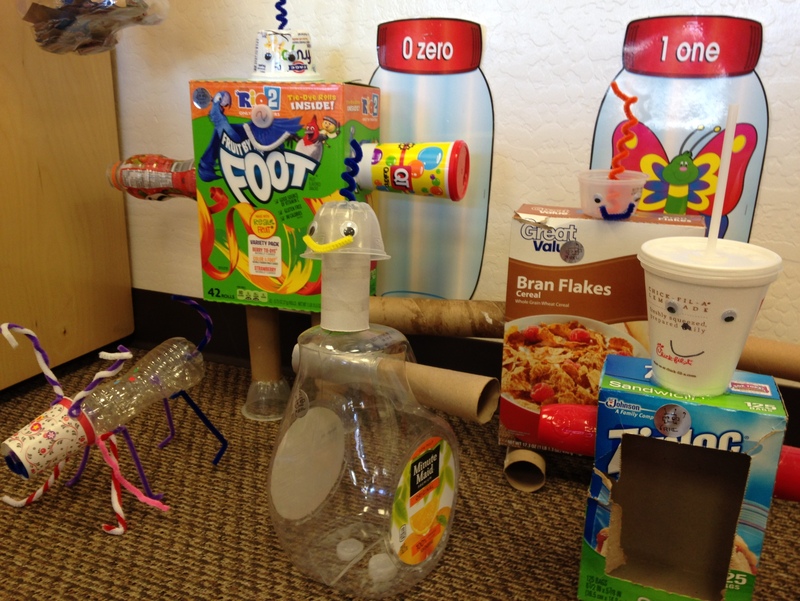 After a winter in hibernation, the Recycle Robots have returned, just in time for Earth Day. 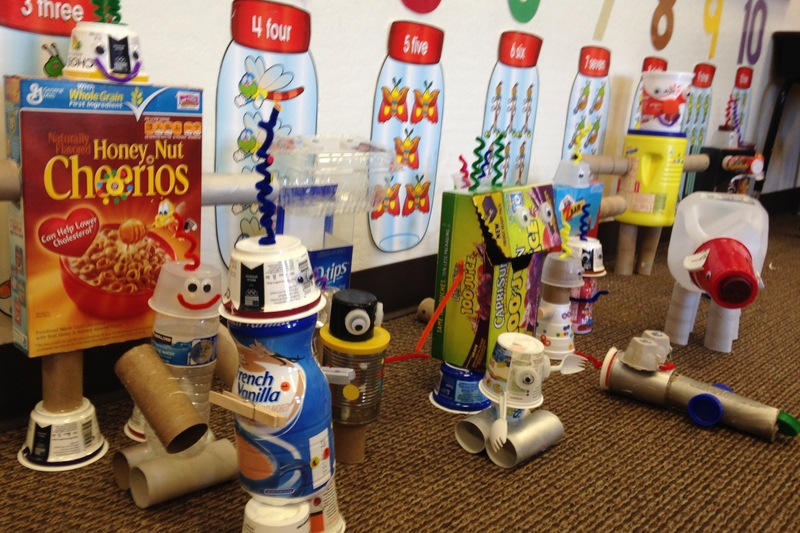 When Eileen Kelly, a kindergarten teacher at nearby Archway Trivium Academy, called to ask if I’d help her students make recycle robots, I happily agreed. 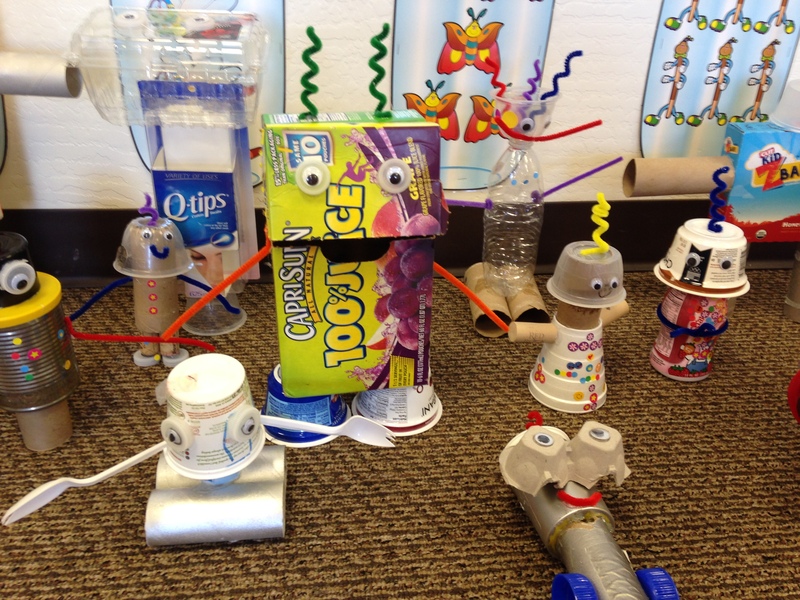 I built a Collector-Bot, which the children spent the next week feeding with recyclables they brought daily from home–cardboard tubes, yogurt containers, lids, cracker boxes, water bottles, vinegar bottles–anything that could fit in its mouth. I watched while Mrs. Kelly demonstrated what happened when she dropped a bottle cap in its mouth (the bottle cap dropped into the see-through “stomach”, whose latched door we then opened to retrieve it). The “oohs” and “aahs” would have made you think she’d made the Statue of Liberty vanish and reappear right there in the classroom. She did the same thing with a yogurt cup, and got the same reaction. She did the same thing with a paper towel tube, and got the same reaction. I knew we had a hit on our hands. 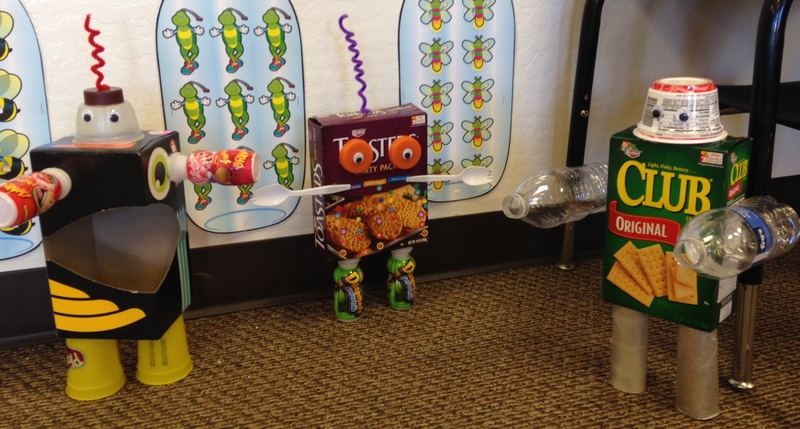 This week, I returned to the classroom to help the kids build their own robots fr om the loot they’d fed the Collector-Bot. And what a pile it was. Thirty-odd five- and six-year-olds sat in a big circle, taking turns picking out robot parts: bodies, heads, legs, and extra bits and pieces that caught their eye. It looked to me like they were just reveling in the opportunity to play with trash. But each one chose main body parts with great thought, and it was fabulous to see their imaginations at work as they visualized the bot they would create. Fortunately, none of the robots caught on fire, but every single one was awesome, from the six-legged robo-deer to the Mountain Dew Monster with munching jaws; from the red-headed milk-jug robo-dog to the graceful, long-necked Minute-Maid with a turning head; from the Q-tip Crusader to the Capri-Sun Creature with the smiling mouth that opens and closes. The kids will take them home–along with, maybe, a new way of looking at what most of us consider trash, a feeling of power that they can create fun in unexpected ways, and a realization that they can help shape their world. Recycle Robot League: Mission accomplished. 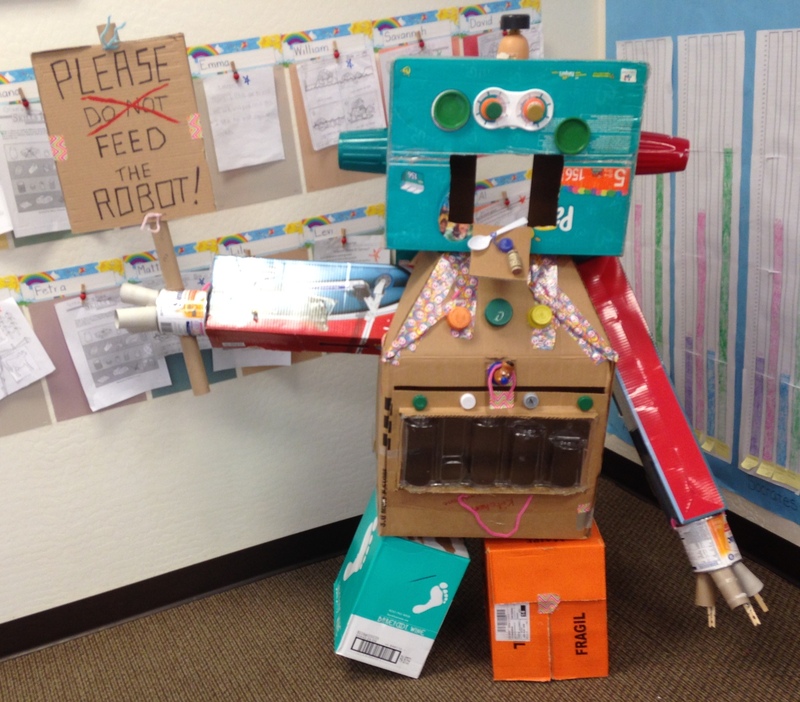 This entry was posted in art, crafts, current events, humor, kindergarten, Recycle Robots and tagged Archway Trivium, art, boxes, cardboard, conservation, containers, crafts, Earth Day, environmentalism, kindergarten, recycle robots, reuse by Betsy Andrews Etchart. Bookmark the permalink. Delightful. This post made me smile ear to ear. If only you lived closer…would love to recycle the contents of my garage. Thanks, Nancy! 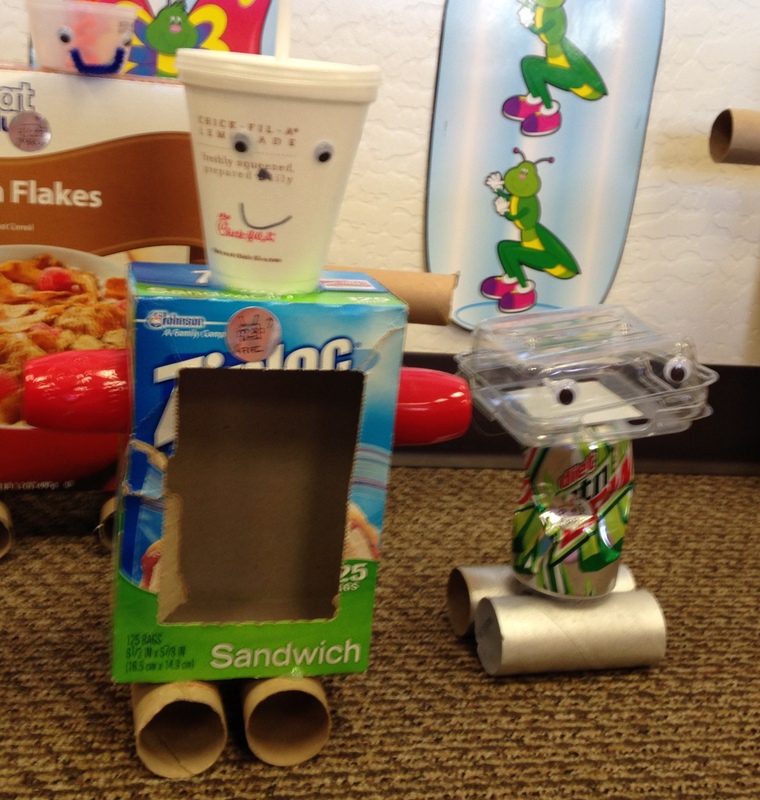 Speaking of garages, Husbot was SO glad to see me donate some of our recyclables to the school! Thanks! And SO much fun.